Click, swipe, pinch, expand. With smartphones and tablets, we find the information we want in a flash. But what happens to our bodies when we constantly look down at smartphones ipads? Put simply our neck muscles become seriously unbalanced which can lead to poor posture, neck pain, numbness, headaches and, in time even arthritis through repetitive wear and tear. Five years ago, the chiropractors at Gorey Family Chiropractic began seeing more and more teens and adults with neck pain. We noticed clients sitting in the waiting room with their chins on their chests, looking into their smartphones. This problem has been popularly dubbed “text neck”. Today with the widespread use of these devices amongst young and old, patients of all ages are seen developing the problem with neck pain, stiffness and the associated problems that go with it. A classic example of good neck alignment with a c shaped curve. 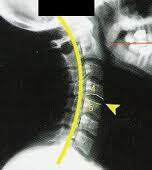 Our neck’s normally have a “banana-like or C shaped curve” that helps distribute the weight of our heads (about 10 to 12 pounds) onto our discs between the neck vertebrae. Constantly looking down at a smartphone or or ipad causes the neck to straighten and lose this curve. The result is uneven distribution of the head’s weight on the neck. The extensor muscles on the back of the neck become overstretched. The flexor muscles on the front of the neck become over strengthened. 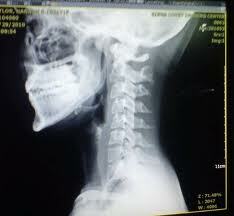 Notice how the curve in this neck has reversed and straightened hindering normal function including shock absorption. As Chiropractors we correct this imbalance by prescribing muscle and spinal joint treatments as well as exercises that strengthen the extensor muscles and stretch the flexor muscles of the neck. But that’s just the beginning. Our Chiropractors educate our clients in how they need to change their behavior so that they don’t undo the benefits of the Chiropractic treatment they are receiving. Smartphones: Rest your right elbow on your side, and hold the phone with your right hand. Use your left arm to support the right so you can hold the phone comfortably. Tablets: Sit with your back against a couch, chair or wall. Bring your knees up and rest your elbows on them as you hold the tablet. Remember when using either device to take regular breaks to correct your posture and do some stretching if you are inclined to suffer neck strain or neck pain. If you can correct a few of these habits and spend more time with good posture rather than poor posture, you will aggravate your neck less often. Awareness is the best solution. Computers are never going away, so we have to try to adapt and become ergonomically sound and more posture aware to prevent neck pain and injury. Our specialist Chiropractic team are trained and hold extensive experience both in Ireland and the U.K in the diagnosis and treatment of back pain, neck pain, nerve and disc disorders as well as treating and managing sports injuries and conditions like osteoarthritis. No GP referral is necessary. On site x ray is offered and for your convenience all of our Gorey Family Chiropractic team are registered with VHI, Glo, Aviva and Laya Healthcare allowing clients claim reimbursement from a wide range of private healthcare Insurance providers including the GAA Scheme. For further information on our range of services to private individuals or specialist occupational health services to companies contact info@chiropractor.ie or alternatively call 053 94 83338.